It is spring, 1811, the morning after a storm. Mary is 12 years old, and fearless. She edges across the cliff to where her brother is already working to free the fossil bones. Fragments of weathered mudstone clatter down onto the beach. The eye sockets of the huge skull are wider than the span of her hand. Of these, ichthyosaurs were arguably the most successful. Their multiple adaptations to a fully aquatic life included huge eyes, a stiffened, fluked tail, and the ability to mate and give birth to live young in water. Much as killer whales do today, these predators structured the marine ecosystem. Many came to resemble the modern whales, dolphins and tuna fish that now fulfil similar ecological roles. 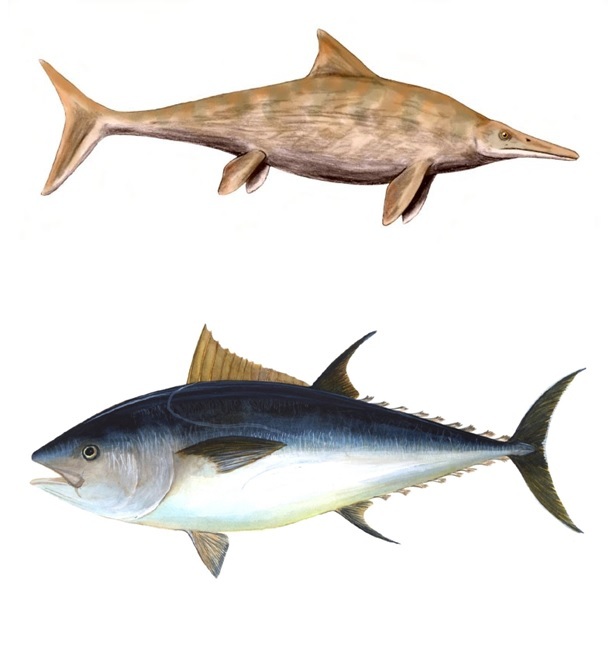 The convergence of body forms between some ichthyosaur species and tuna are particularly astonishing because these reptiles were air breathers. Why did icthyosaurs evolve to look like modern marine animals? Life in water poses a specific set of challenges. 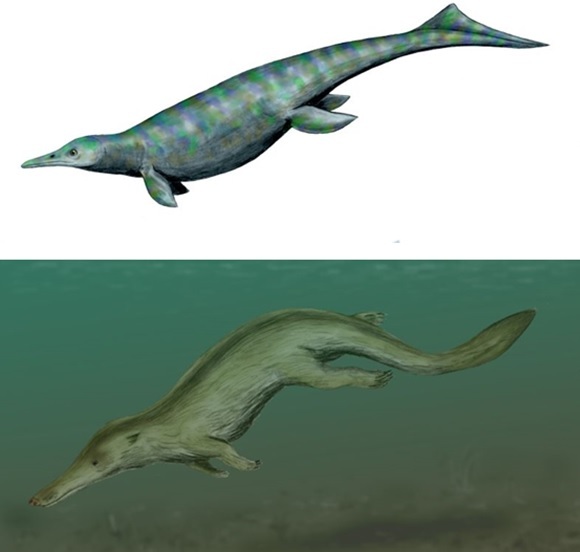 These marine reptiles fulfilled similar ecological roles to whales, and in time evolved body forms similar to these modern mammals. This is known as convergence. Like whales and tuna, ichthyosaurs were adapted for long distance energy-efficient swimming. The respective horizontal and vertical strokes of both ichthyosaur and dolphin tails give an equally powerful ‘lift’ in both directions, propelling these animals forward in a near straight line. A further example of this convergence is seen in the modern otter. 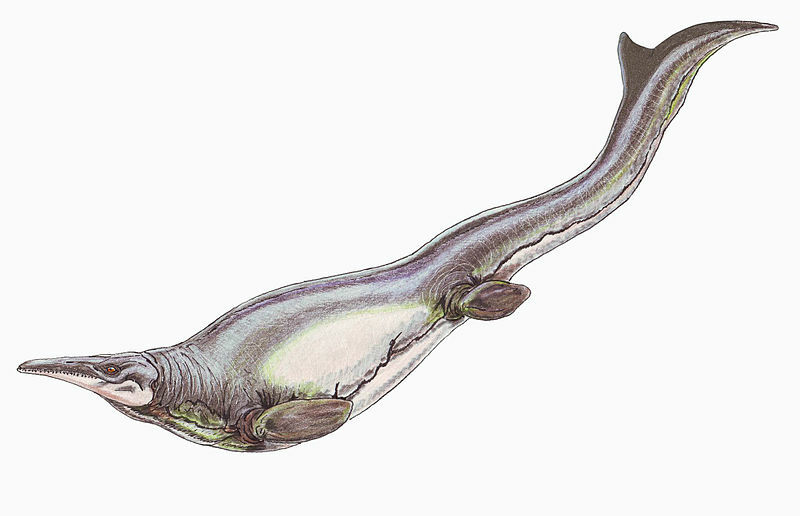 Unlike the Ichthyosaurs, both whales and otters had land-based mammalian ancestors with a vertically moving spine, giving them their bounding gait. The whale-like ichthyosaurs moved their tail flukes horizontally, like a modern lizard. Like whales and tuna, ichthyosaurs were adapted for long distance energy-efficient swimming. The respective horizontal and vertical strokes of both ichthyosaur and , propelling these animals forward in a near straight line. What can modern animals tell us about ichthyosaurs? Modern tuna and lamnid sharks have converged into a similar ‘deep water sprint-predator’ ecological role. These long distance migrants move constantly at a moderate speed, except for short fast bursts when chasing prey. Chunky vertebrae stiffen their bodies at their core, reducing sideways movements except at the narrow ‘hinge’ before the tail. 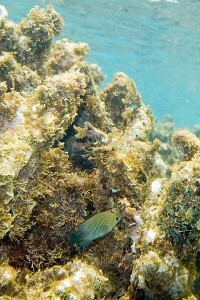 The continuously active red ‘cruising’ muscles either side of the spine are warm, in marked contrast to most other fish. In combination with large tendons, these muscles work like pulleys, flicking the fluked tail from side to side. 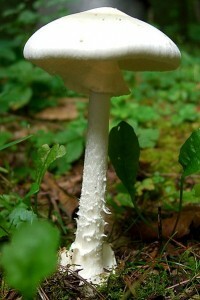 The surrounding white muscles give extra power during short ‘sprints’. The ichthyosaur Stenopterygius was tuna-shaped with chunky stacked vertebrae. This stiffened body form suggests that these reptiles converged on the cruise-and-sprint deep water hunting role of modern tuna and lamnids. Did ichthyosaurs have warm muscles like whales and tuna? The isotopic proportion between the heavy 18O and the light 16O oxygen (the ratio is given as d18O) in the bones of living fish and marine animals decreases as body temperature increases. In principle we can use cold-blooded fish fossils as a ‘thermometer’ to indicate the water temperature, and compare this against isotope-predicted body temperatures for other fossil animals from the same rocks. Oxygen isotope data allows us to infer that Jurassic plesiosaurs and ichthyosaurs had body temperatures of around 35⁰C, much higher than that of their environment. This indicates that they could generate heat, and may well regulated their body temperatures independently of their environment (homeothermy). Modern warm bodied marine animals have to conserve their body heat. This means it is reasonable to infer that ichthyosaurs used similar methods such as a counter-current blood circulation system and/or heat-insulating blubber. What happened to the ichthyosaurs? 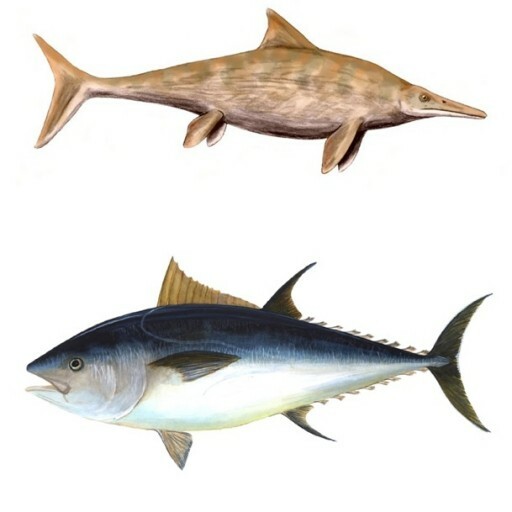 Ichthyosaurs dominated the world’s oceans for around 150 million years, but then disappeared from the fossil record after the mid-Cretaceous (around 95Ma). The cause of their sudden extinction remains a mystery. The empty ecological roles that this created were later filled by mosasaurs; relatives of modern monitor lizards including the Komodo dragon. In turn these reptiles died out during the Cretaceous-Tertiary mass extinction (65Ma), making way for the later evolution of modern whales, dolphins and tuna. 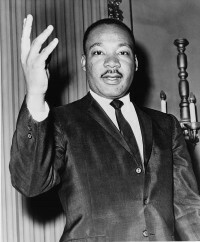 Benson, R.B.J. and Butler, R.J. (2011)  Uncovering the diversification history of marine tetrapods: ecology influences the effect of geological sampling biases In Comparing the Geological and Fossil Records: Implications for Biodiversity Studies ( A.J. McGowan and A.B.Smith, eds). Geological Society of London Special Publications 358, 191-208. Bernal, D. et al. (2005)  Mammal-like muscles power swimming in a cold-water shark. Nature 437: 1349-1352. Brill, R.W. (1996)  Selective advantages conferred by the high performance physiology of tunas, billfishes and dolphin fish. Comparative Biochemistry and Physiology, A 113, 3-15. Dickson, K.A. and Graham, J.B. (2004)  Evolution and consequences of endothermy in fishes. Physiological and Biochemical Zoology 77, 998-1018. Donley, J.M. (2004)  Convergent evolution in mechanical design of lamnid sharks and tuna. Nature 429, 61-65. Fröbisch, N.B. et al. 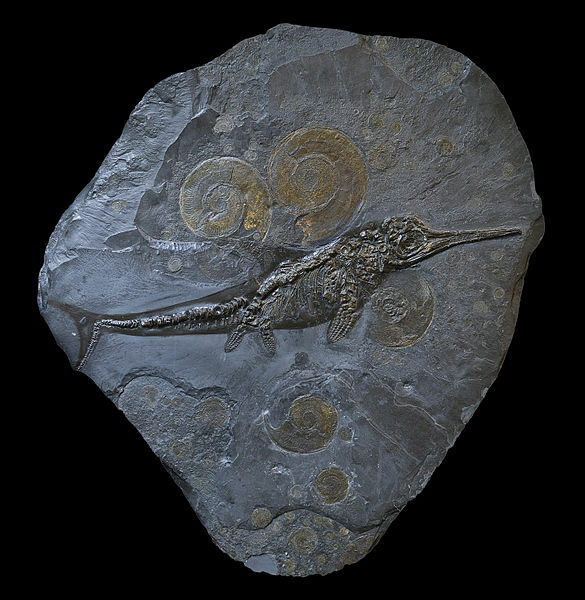 (2013)  Macropredatory ichthyosaur from the middle Triassic and the origin of modern trophic networks. Proceedings of the National Academy of Sciences, USA 110, 1393-1397. Graham, J.B. and Dickson, K.A. (2004)  Tuna comparative physiology. Journal of Experimental Biology 297, 4015-4024. Houssaye, A. (2013)  Bone histology of aquatic reptiles: what does it tell us about secondary adaptation to an aquatic life? Biological Journal of the Linnean Society 108, 3-21. 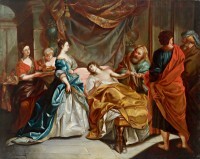 Korsmeyer, K.E. et al. (1996)  The aerobic capacity of tunas; adaptation for multiple metabolic demands. Comparative Biochemistry and Physiology, A 113, 17-24. Lindgren, J. et al. 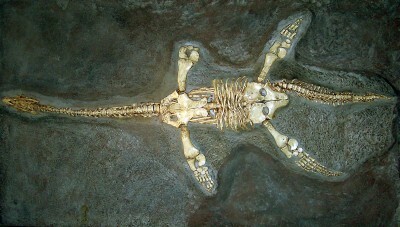 (2007) A fishy mosasaur: the axial skeleton of Plotosaurus (Reptilia, Squamata) reassessed. Lethaia 40,153–160. Lindgren, J. et al. (2011)  Landlubbers to leviathans: evolution of swimming in mosasaurine mosasaurs. Paleobiology 37, 445-469. Lingham-Soliar, T. and Plodowski, G. (2007) Taphonomic evidence for high-speed adapted fins in thunniform ichthyosaurs. Naturwissenschaften 94, 65-70. Malte, H. et al. (2007) Differential heating and cooling rates in bigeye tuna (Thunnus obesus Lowe); a model of non-steady heat exchange. Journal of Experimental Biology 210, 2618-2626. Motani, R. et al. 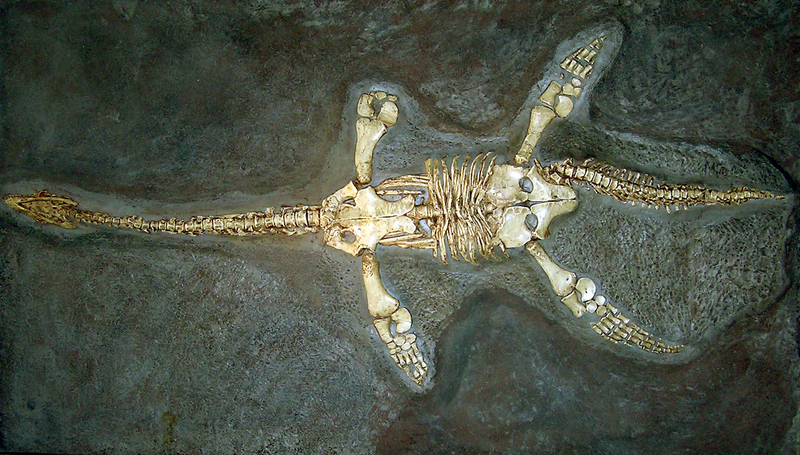 (1998) Ichthyosaurian relationships illuminated by new primitive skeletons from Japan. Nature 393, 255-257. Motani, R. (2002) Scaling effects in caudal fin propulsion and the speed of ichthyosaurs. Nature 415, 309-312. Motani, R. (2002) Swimming speed estimation of extinct marine reptiles: energetic approach revisited. Palaeobiology 28, 251-262. Motani, R. (2010) Warm-blooded “Sea Dragons”? Science 328, 1361-1362. Rothschild, B. M. et al. (2012)  Adaptations for marine habitat and the effect of Triassic and Jurassic predator pressure on development of decompression syndrome in ichthyosaurs. Naturwissenschaften 99, 443-448. Syme, D.A. and Shadwick, R.E. (2011)  Red muscle function in stiff bodied swimmers: there and almost back again. Philosophical Transactions of the Royal Society, B 366, 1507-1515. Thewissen, J.G.M. and Bajpai, S. (2009)  New skeletal material of Andrewsiphius and Kutchicetus, two Eocene cetaceans from India. Journal of Paleontology 83, 635-663.